Neurons (nerve cells) are made up of a soma, dendrites, axons, and a myelin sheath. The dendrites conduct impulses towards the soma, whereas the axons conduct impulses away from the soma. The myelin sheath allows the neuron to rapidly pass on nerve impulses. 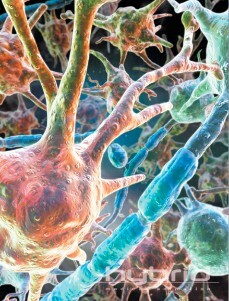 When neurons are connected, a synapse forms in which the axon of one neuron is almost connected to the dendrite of another neuron with a gap in between them. As the signal reaches the synapse, neurotransmitters are released to transfer the signal over to the dendrite of the receiving neuron ("Human Physiology"). More about the neurons and their synapses are discussed in the video below. Sensory Neurons allow you to experience the outside world using your senses, such as seeing, feeling, smelling, hearing, and tasting. Motor Neurons communicate with muscle fibres to make them contract or relax. They allow you to move your body. Interneurons communicate with other neurons. They are abundant in your brain and allow you to process information and think. 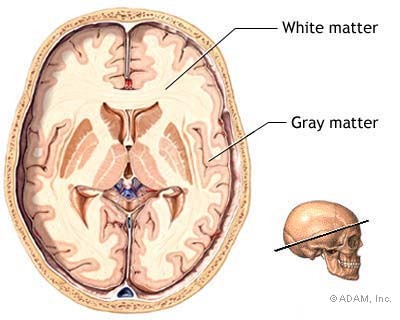 Gray Matter are the nerve cell bodies located in the outer layer of the brain. White Matter are the nerve fibers located in the inner layer of the brain. Ganglia are clusters of nerve cell bodies in the PNS that serve as relay centers. Nerves are bundles of axons in the PNS. The PNS further divides into the somatic nervous system, which controls the voluntary actions of the body, and the autonomic nervous system, which controls the involuntary actions of the body. The autonomic nervous system if divided again into the sympathetic and parasympathetic nervous systems. The sympathetic nervous system supports the "flight or fight" response. The parasympathetic nervous system supports the "rest and digest" response.